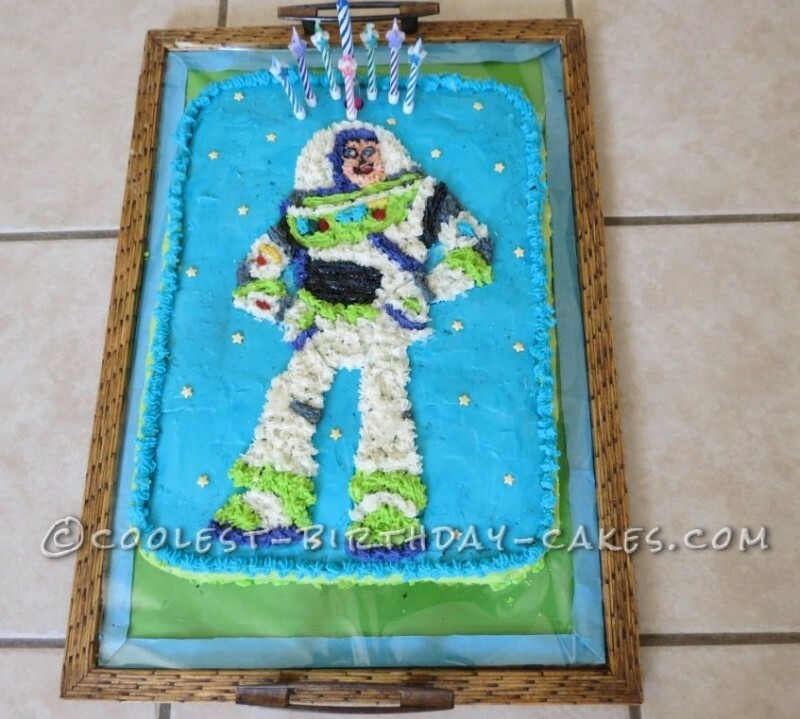 My grandson loves the Toy Story DVD’s and asked me to bake him a Buzz Lightyear birthday cake for his 8th birthday. I couldn’t find a suitable image of him on the internet so I looked through several Toy Story coloring books until I found a nice picture of Buzz Lightyear. I bought the book and enlarged the picture on a photocopy machine to the size of my oven tray and cut the picture out. I used two packets of cake mix and baked the cake in a large rectangular oven tray. Then I mixed the butter icing using icing sugar, white margarine and different gel food coloring: electric green, electric blue, copper (flesh tone), violet, egg yellow, super black and super red. I made 9 bowls with 9 different colors butter icing before I started to ice the cake. On the first day I only covered the top of the cake with blue butter icing and the sides of the cake with green butter icing, smoothing it with a blunt knife. Early the next morning I placed the picture of Buzz Lightyear on top of the cake where I wanted it and used a toothpick to trace around the edges of the picture. Then I started to ice Buzz Lightyear in the correct colors using different star tips. It was hard and back aching work and it took me the whole morning to complete. After each color I had to wash all the icing utensils before I started with the next color. Finished with that I decorated the edges of the cake (green at the bottom and blue on top) also using a star tip. At last I stuck 7 colored candles (green, blue, purple and pink) with little stars on top and a bigger blue “singing” candle above Buzz Lightyear’s head. I finished the cake sticking some yellow star fun sprinkles on top of the cake which looked very nice on the blue background. My back ached a lot after I had finished the cake although I had put some bricks under the legs of the table to make it higher. When my two grandchildren came home after school their delighted faces and appreciative comments made all my efforts worthwhile. 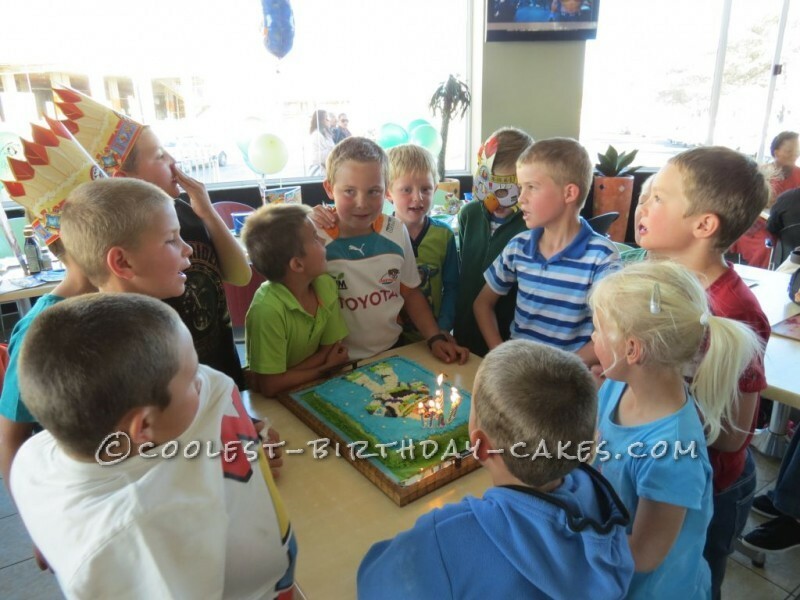 The next day at his birthday party his friends were also thrilled with the cake and they enjoyed it very much but I must admit that the candle singing “ Happy Birthday to you” was part of their excitement. I had to buy the candle three months ago in Cape Town when we were there on holiday.